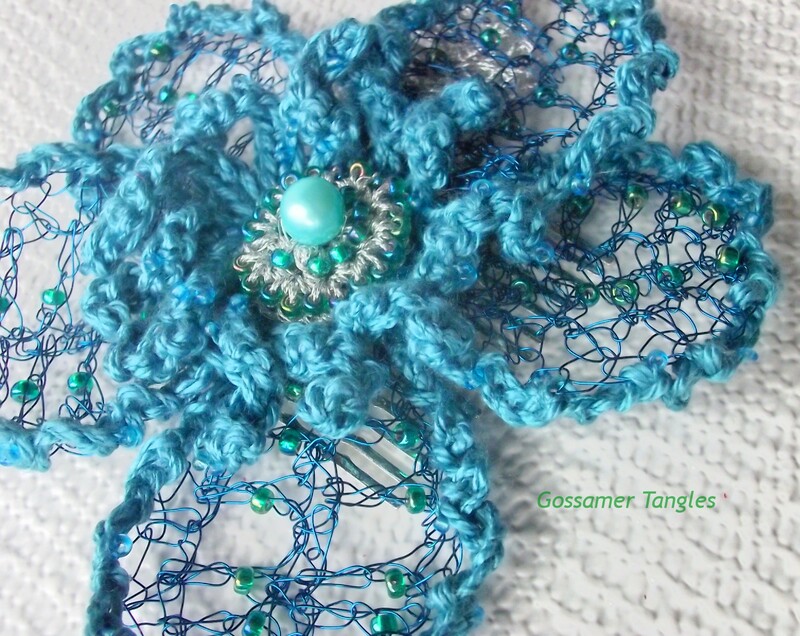 I like to crochet with materials that are a bit off the beaten path. I also like to combine materials that aren't usually used together. 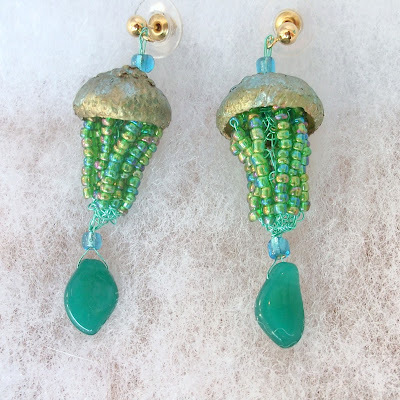 I thought I'd share a couple of "materially different" ideas that I've found to be fun and successful in adding texture, interest, and in some cases, practicality, to my pieces. Wire crochet for jewelry has become fairly popular. 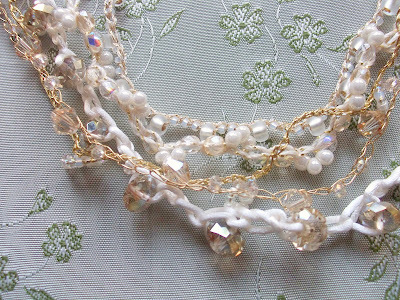 Using fiber to make necklaces, bracelets, and earrings has also become more common. 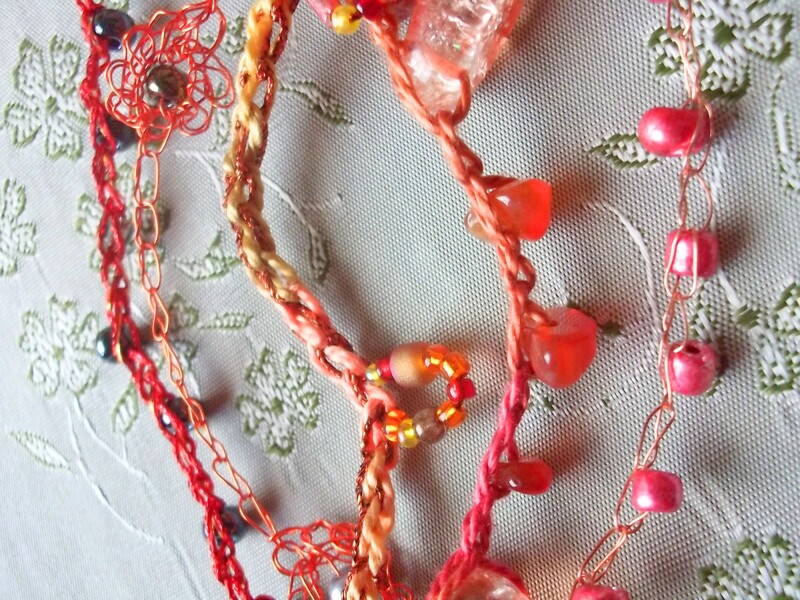 I enjoy combining the two materials. 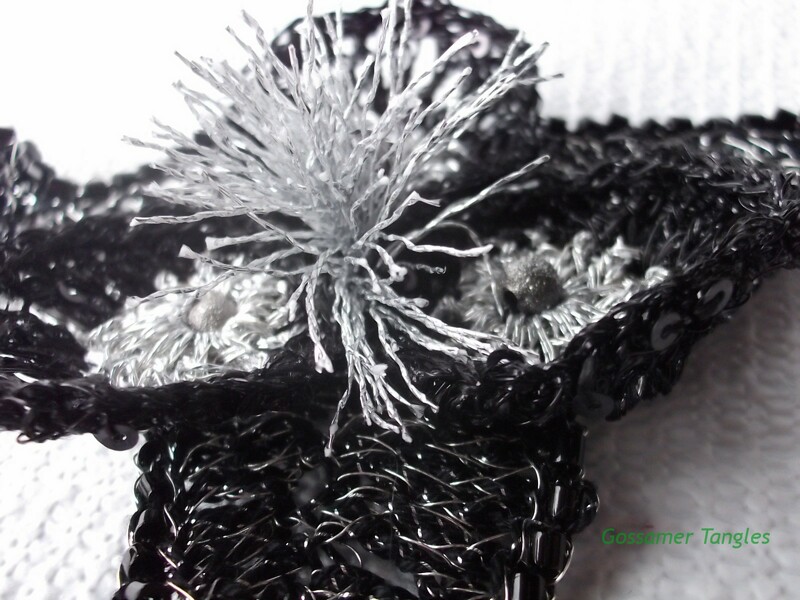 Adding the wire gives body and a hint of metallic shine to many of my pieces. 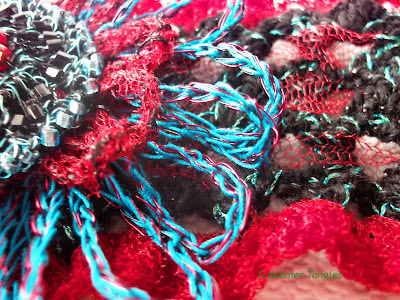 It also gives an interesting texture. 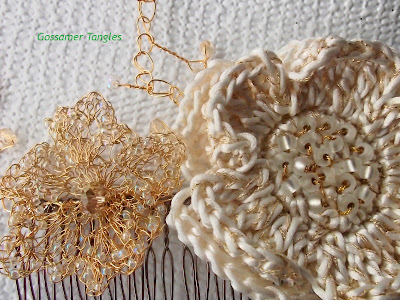 I find that using 28 or 30 gauge wire gives me the most flexibility in my work -- both from a design standpoint and in terms of ability to work with wire and fiber together. Lower gauge number wire tends to be stiffer and more difficult to manipulate when worked together with the thread-type fiber I use in my jewelry. 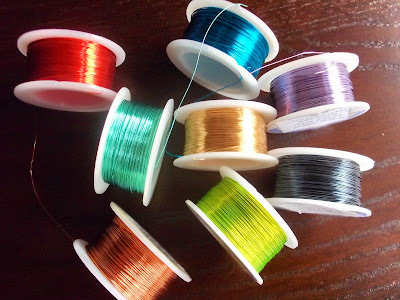 I've found it almost impossible to obtain 28 or 30 gauge wire in any kind of color range in my local arts and crafts stores, so I order it online. My favorite wire to work with, because of the wide range of available colors and the quality of the wire, is Artistic Wire. 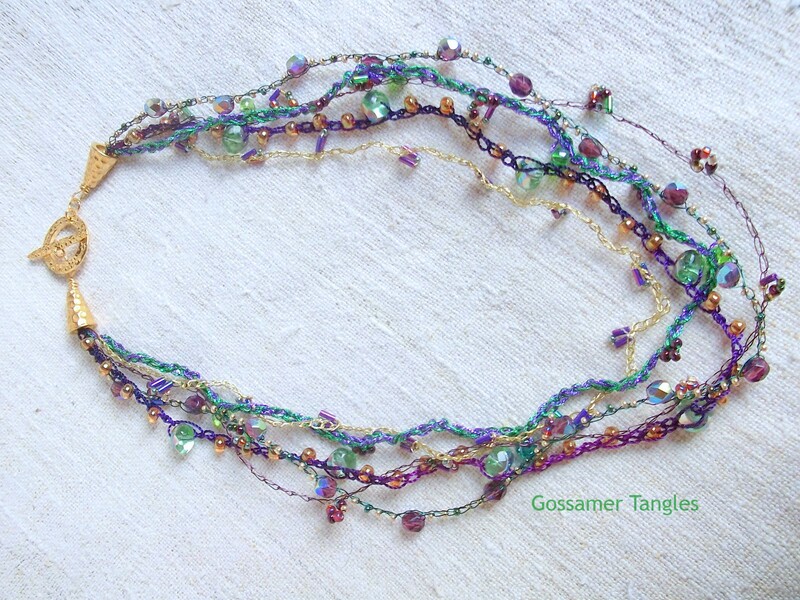 The color is permanent and does not scratch or flake when I work with it ... even when I use steel hooks. 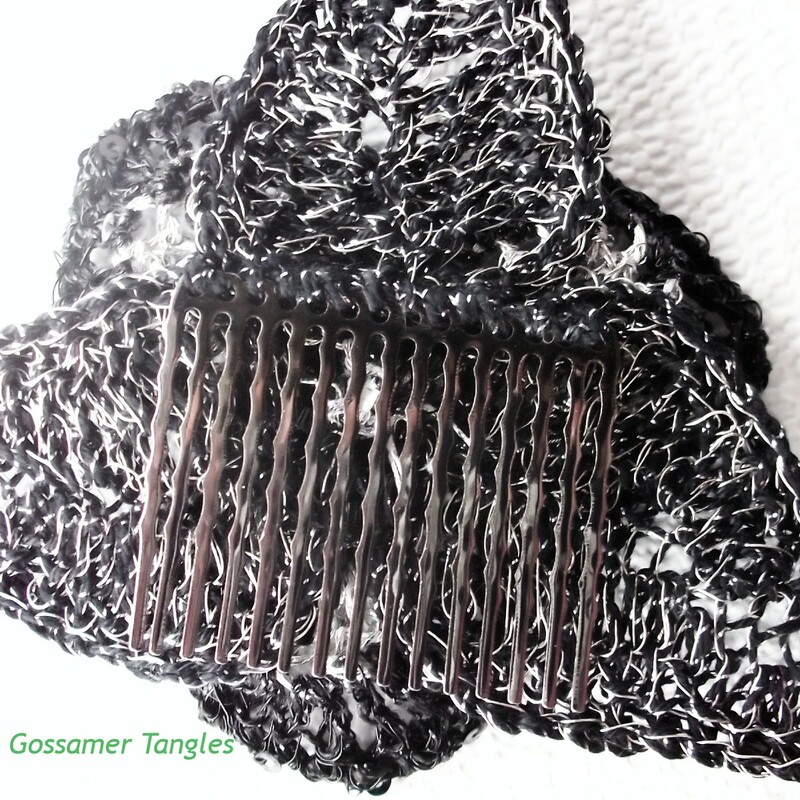 However, even many online suppliers of Artistic Wire do not carry the thinner gauges I like to work with in a full range of colors. 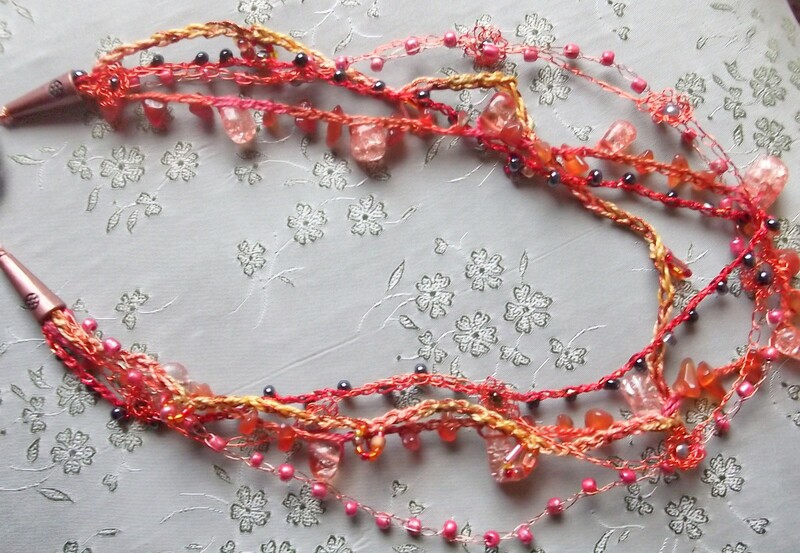 One online source I've found that pretty consistently has the colors and gauge I need is Fusion Beads. 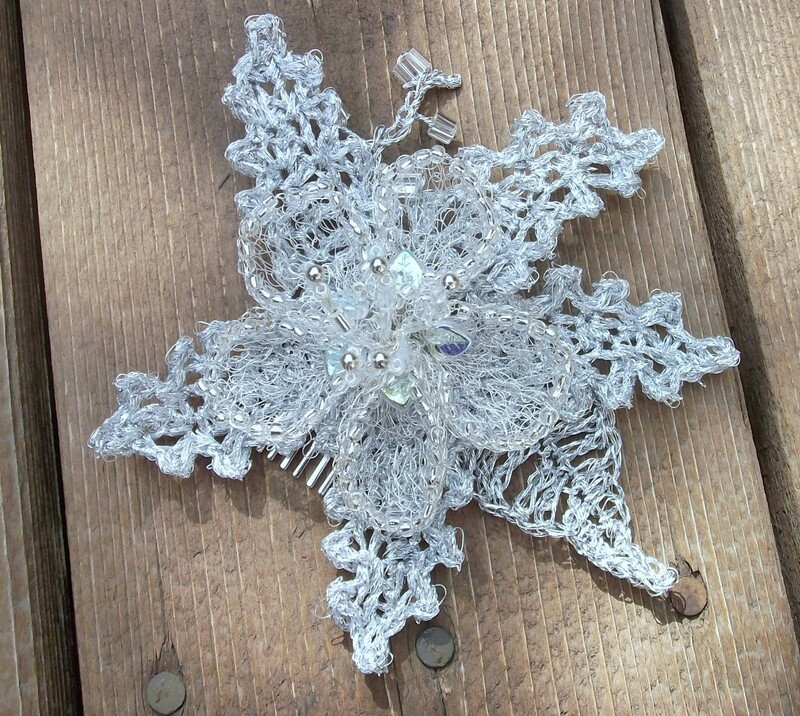 I'm sure there are others, but I'm providing a link to this site for your convenience. 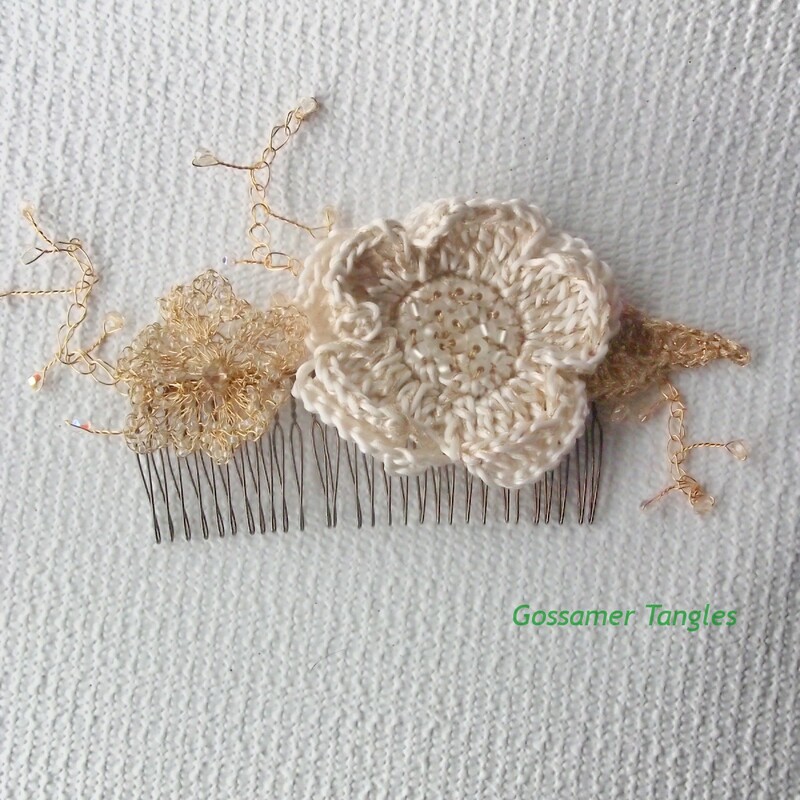 I've found that using a combination of wire and fiber works particularly well for hair ornaments and hair accessories. 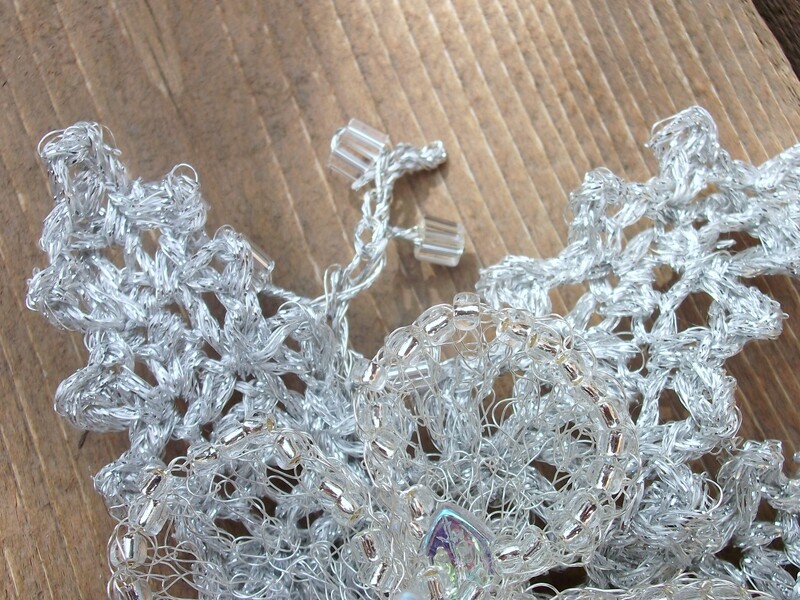 The wire gives these pieces the body they need to retain their shape when worn. It also provides flexibility so that the hair accessory can be bent or molded as needed to look its best with a particular hairstyle. 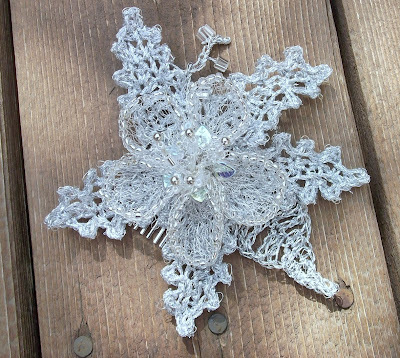 In this bridal hair comb, silver wire, silver threads, and iridescent white threads are crocheted together. 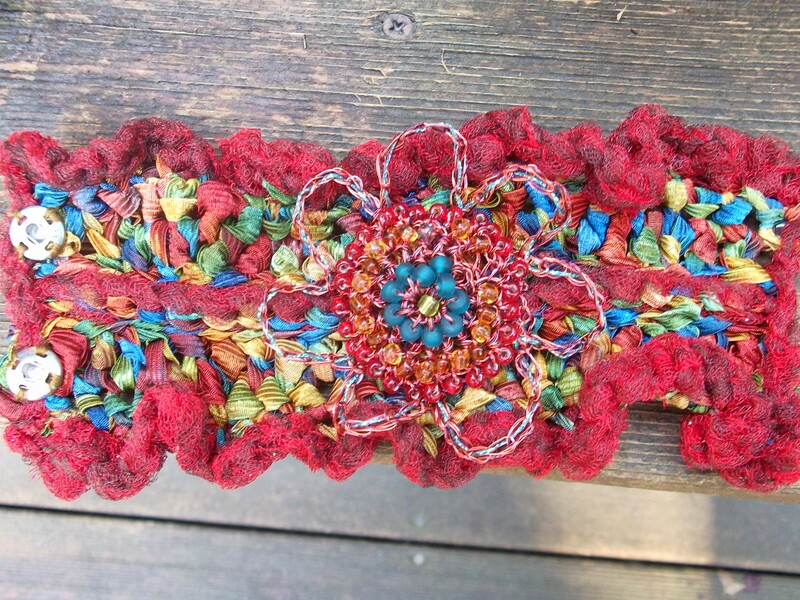 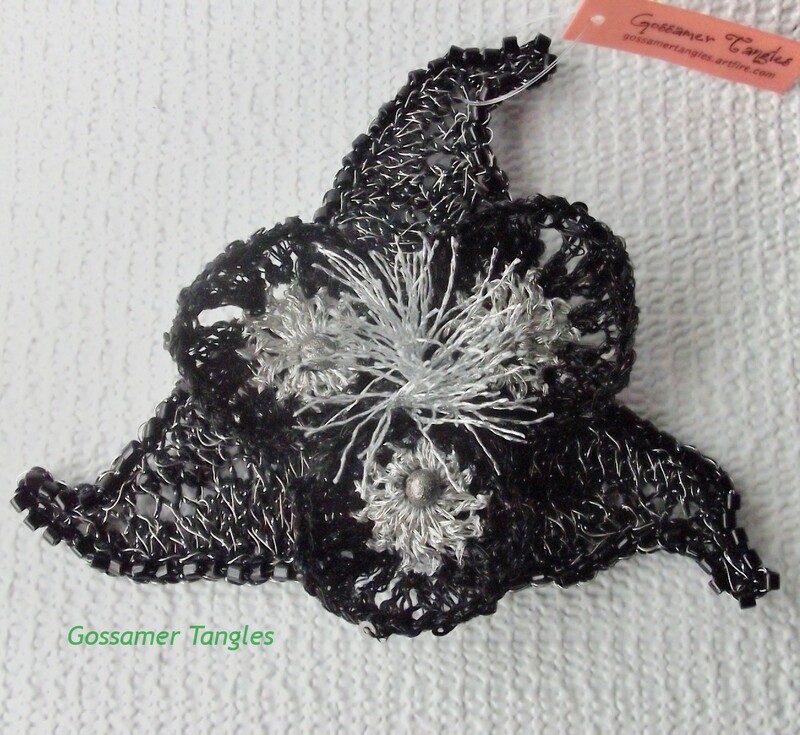 The petals are crocheted with wire and glass beads, and then the edges of the petals are done in a silk fiber. Silver wire is combined with a black, sequin embellished thread. Iridescent pearl thread and gold wire crocheted together. 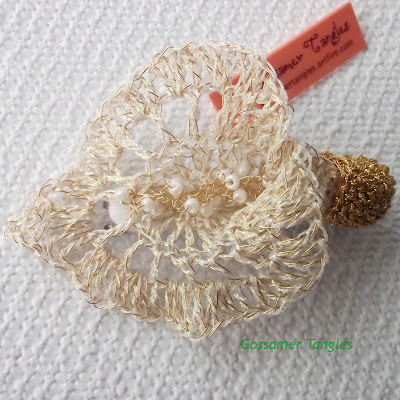 Gold wire, creamy silk cord. I also like the wire and fiber combination in all kinds of jewelry. 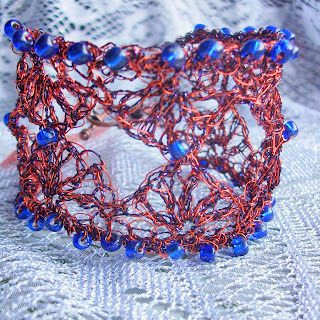 In this cuff, the wire provides the needed body, as well a point of textural interest and a source of color. 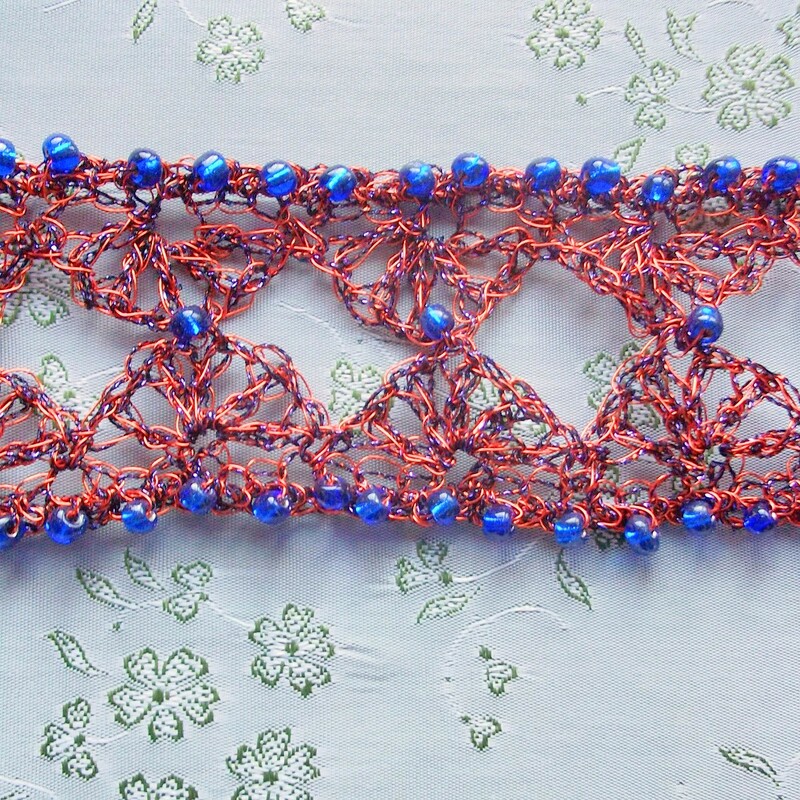 Tangerine wire and metallic thread crocheted in fan pattern. 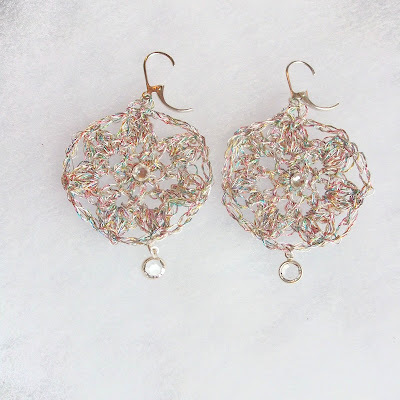 In these earrings, using wire with the fiber to create the circular motifs again provides the necessary body and stiffness for the design to remain intact when worn, and avoids the need to starch or shellac the motif, as you'd need to do to maintain the integrity of a design done solely in thread. 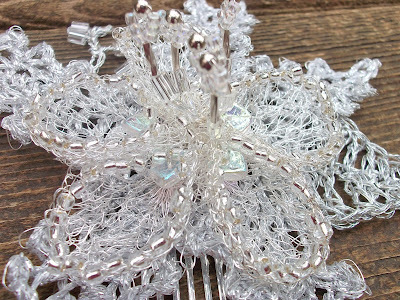 Silver wire and silver/pastel metallic thread. In this necklace, the wire in combination with the fiber, adds interesting texture and shine elements. 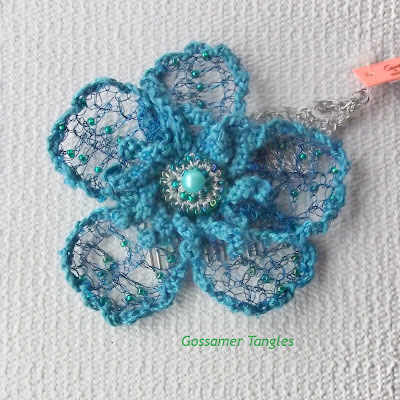 In addition to the wire/fiber combination, I like trying out less common types of thread and fiber in my crocheted jewelry. One fiber that I've particularly come to rely on is Kreinik metallic thread. 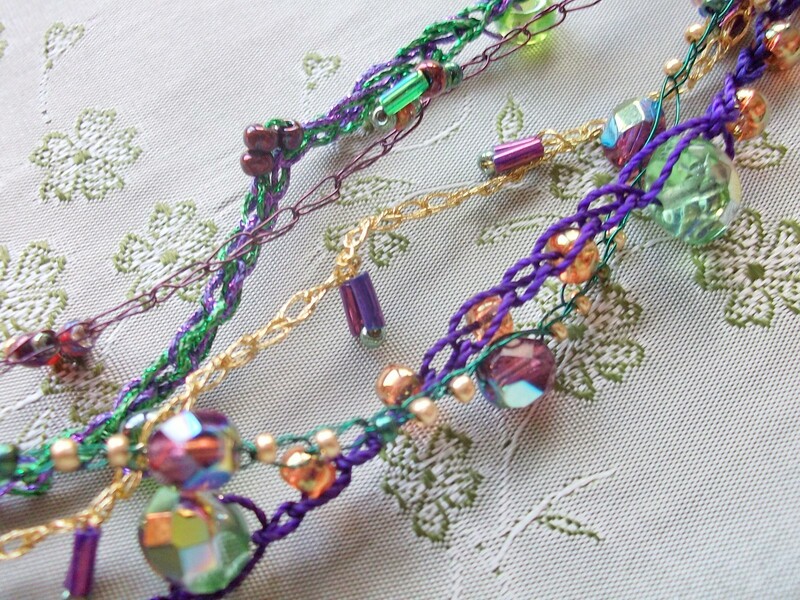 It comes in so many gorgeous colors! 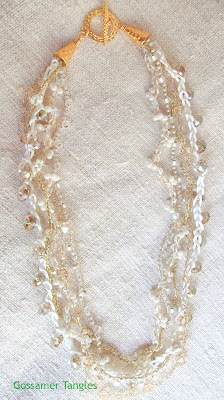 I like to use the very fine (#4) or fine (#8) braid. Usually used for embroidery or needlepoint, I've found that it makes a great addition to my crocheted jewelry. 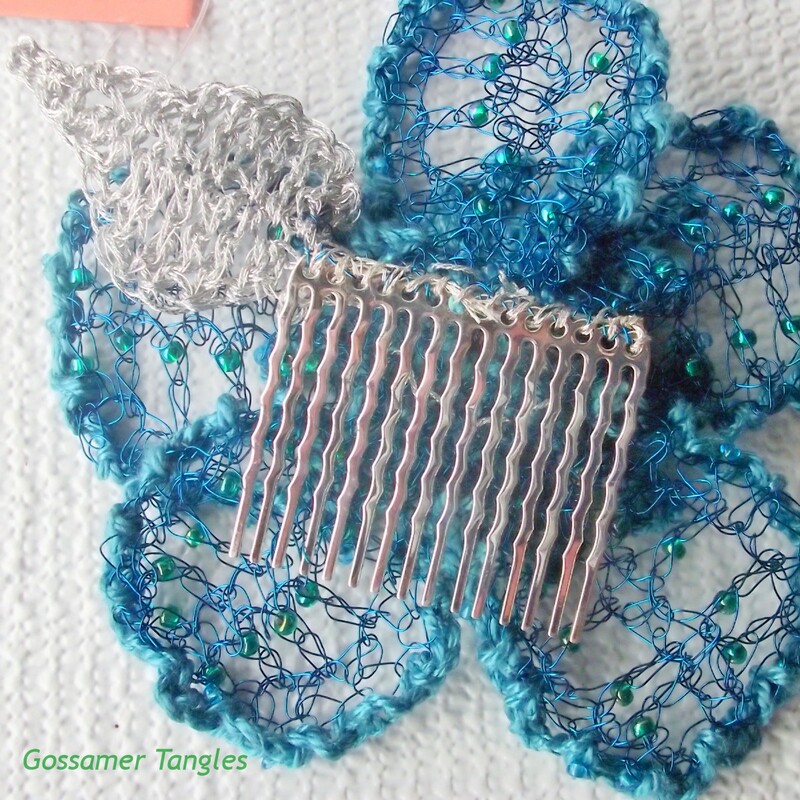 I usually combine it with another type of thread, or sometimes with wire. 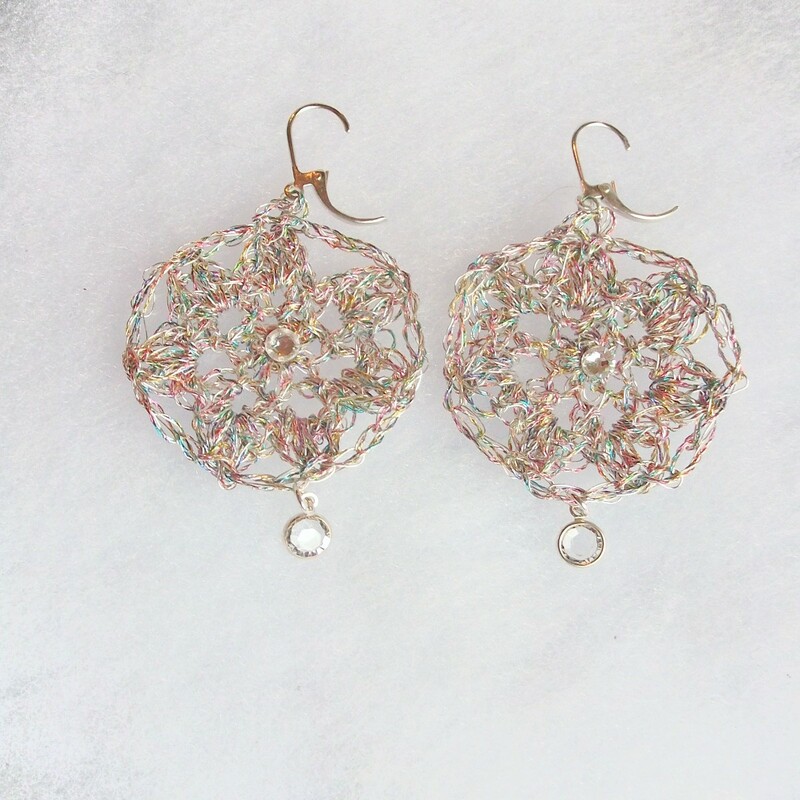 It only comes on small yardage spools -- which makes it fine for jewelry, but not useful for other crochet projects. 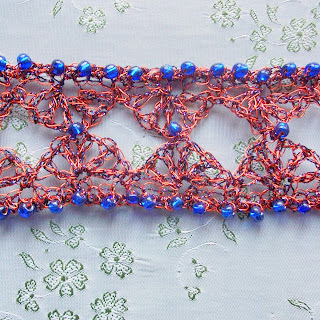 As with the wire, unfortunately, it is not the easiest thing to lay your hands on -- at least not anywhere in the vicinity of where I live -- so I usually have to resort to buying it online. 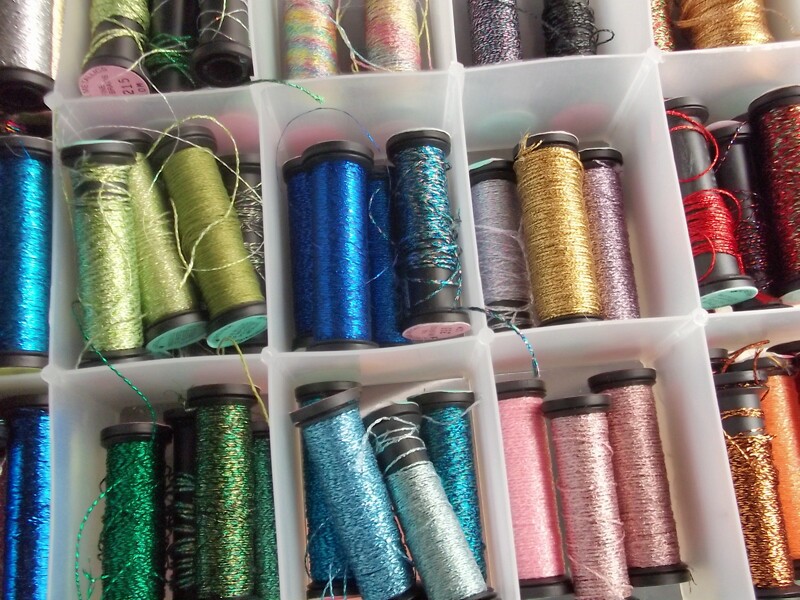 Stitching Bits and Bobs, which is at least in Michigan, has a great selection, but I'm sure there are other sources. In fact, Kreinik has a list on their website. 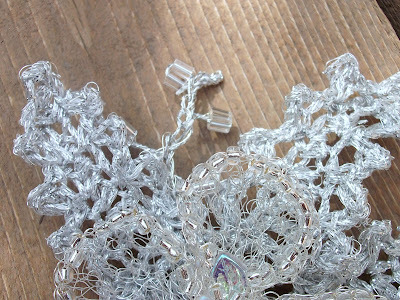 One other interesting material that I've used for crochet is tulle. 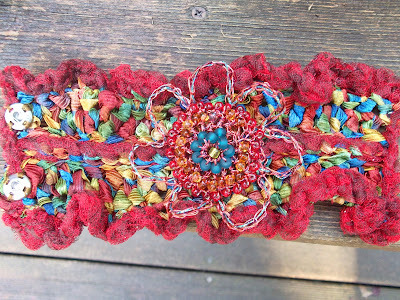 I simply cut the fabric into long thin strips and then use it as I would yarn, or any other fiber. I've used it in two, fairly bold, cuff designs. 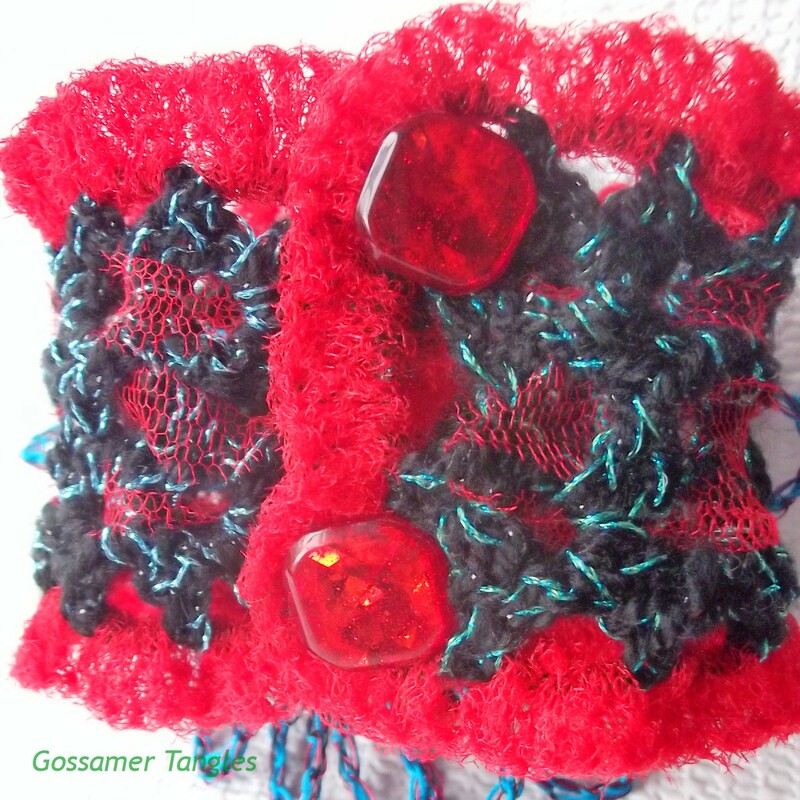 Red tulle strips are crocheted along the edge and also are threaded through the stitch pattern in the body of the cuff. 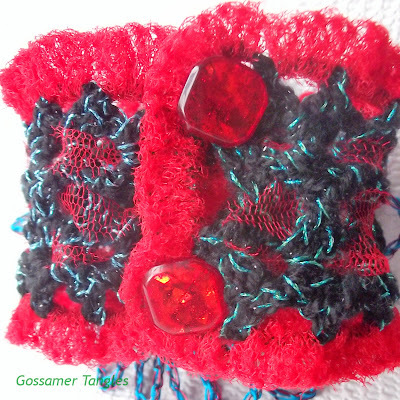 Red and brown tulle strips were combined and crocheted around the cuff edge. Both of these pieces again showcase the interesting effects that can be achieved by combining materials and crocheting them together. 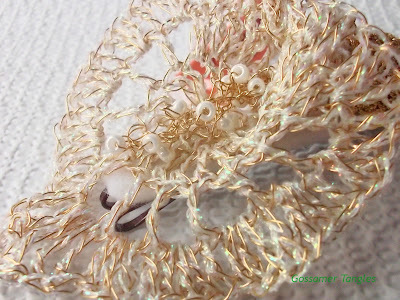 Wire, tulle, and various fiber types were used in both cuffs. 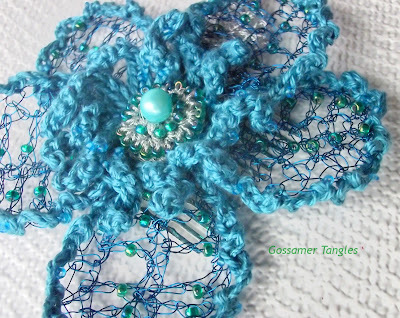 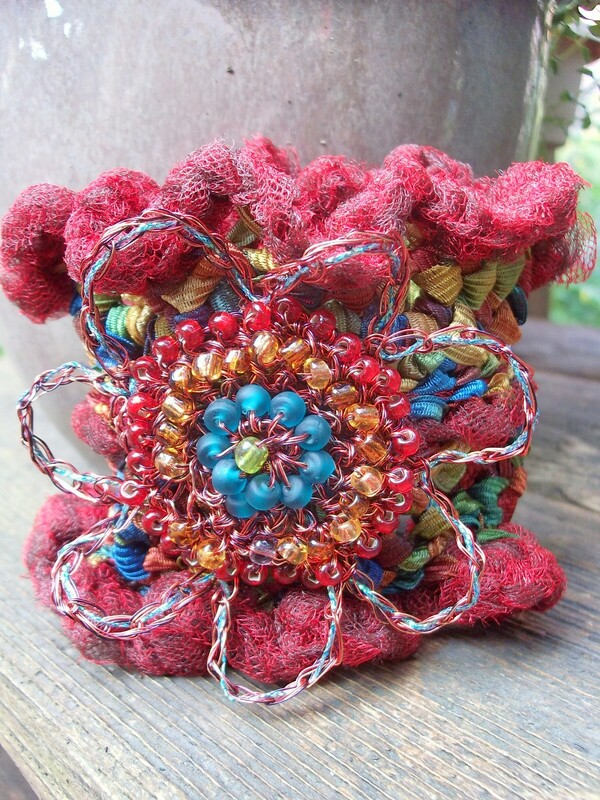 You can see how adding the wire to the crocheted flowers allows them to retain their shape. One other little tidbit. 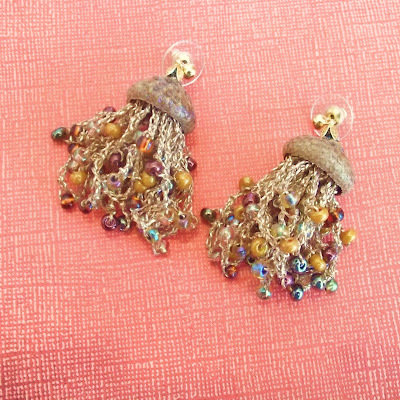 While I didn't actually work them into crochet stitches (not sure how you could), I have combined crocheted elements with acorn caps to make earrings. 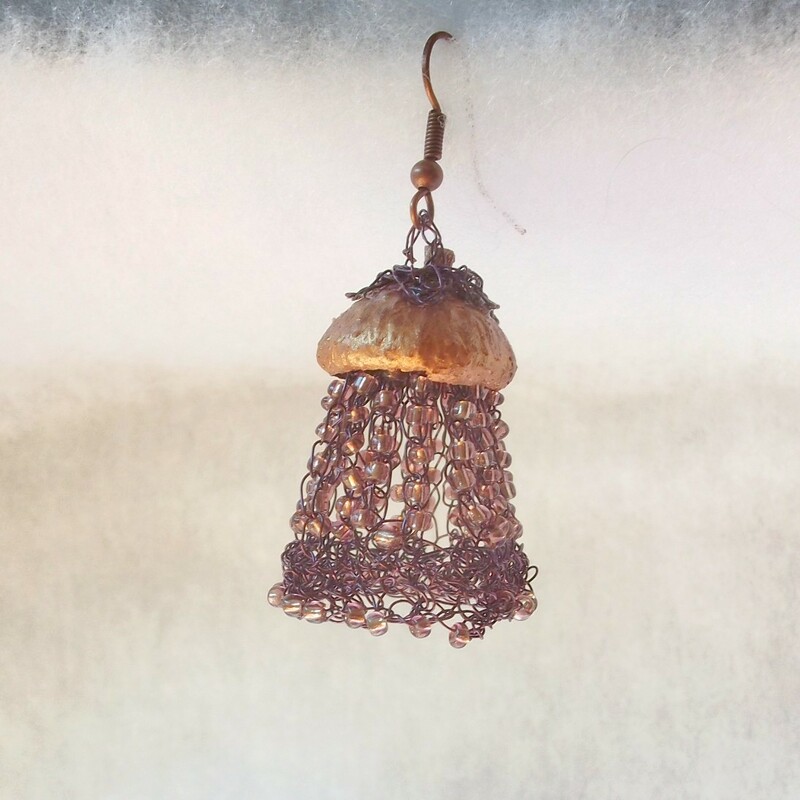 Some fun and unique pieces resulted. I especially like the ones that look like jelly fish, or lanterns (depending on your perspective). 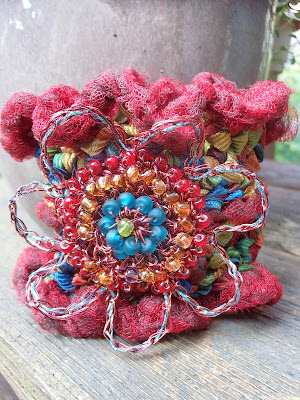 Have you ever crocheted with unique materials or combined materials in an interesting way? 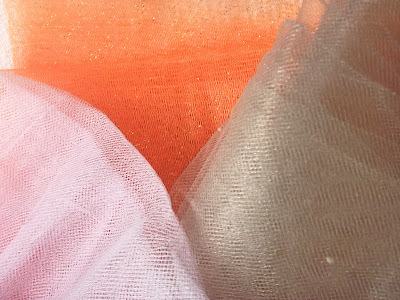 If so, I'd love to hear about it. 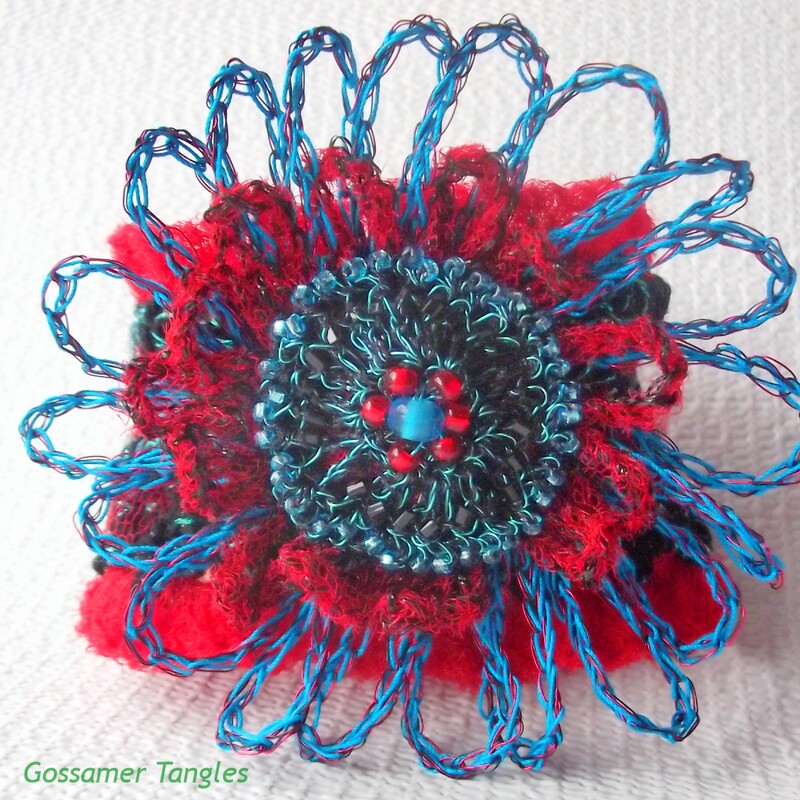 It's always fun to experiment!